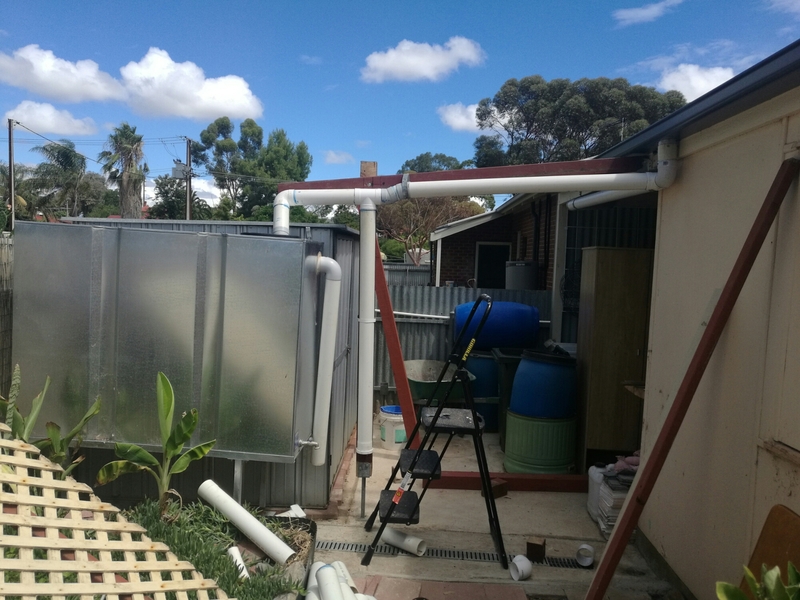 Over the last couple of days Lon and I have moved one of the 1000 litre tanks and redone the downpipes that come off the rear roof and the carport. The car port used to run to a 300 litre tank that is now in the front garden, so the capture of rain water will be far more efficient. I recently ran 20 mm PVC pipe from the other 1000 litre tank to the newly positioned 300 litre one in the front. This way we can pump from the bigger tank to the smaller. The smaller tank is linked directly to the front dripper system and positioned at a good height. Now we can spread 300 litres around most of the front at the turn of a tap. It doesn’t have enough pressure to run the sprinklers, but that’s why I’ve fitted them all with taps, so I can turn them off when using tank water and just use the drippers. We replaced the 15mm pipe that used to run from the rear tank to a tap at the front with 20mm. Also, we raised that tank about 50mm. That’s given us better pressure and allowed us to raise the tap to a height where we can easily put a bucket underneath. Going crazy with pipes, I constructed a manifold that allows us to switch between pumping to the front 300 lites tank, pumping all around the back of the house to the front 750 litre tank ( that’s joined to the drippers too ) or switching to another pipe that will feed the upcoming aquaponics. Soon, I will plumb the newly moved 1000 lites into those lines too, with its own bilge pump. Next, though is to join my little work shed and plumb Jelina’s work area into the new pipes so that she can get water there at the flick of a switch. Did I mention that all the pumps will be working from the solar? The current one is, and it will be easy to add another two. I’ve found that 500 GPH is the best flow rate for our size and needs, though the aquaponics may need something bigger. All in all, I’m happy with the system and the planned changes. Soon we will be able to shunt water easily between tanks. It’s always been a bit of a bugbear of mine that often one tank is full while another is empty and because they don’t all fill from the same part of the roof, quite a bit is lost to the storm water. Now we are on the way to making our rain harvesting much more efficient. This will mean also that we won’t need as much storage (though a slimline 1000 litre is on the cards for the unused downpipe at the front) Thats great because we have so little space. I think that water is our most valuable resource and that it’s artificially underpriced. That will change in the not too distant future as populations increase, weather patterns change and pollution affects the amount of potable water available. It’s only sensible to maximize the use of this valuable resource to ensure that there’s enough for everyone.